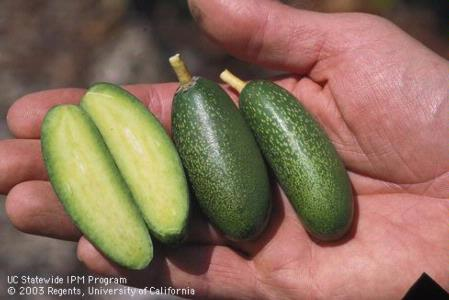 Assessing water quality for Southern California agriculture typically revolves around the total salinity of the water, its total dissolved solids (TDS), and the toxic ions boron, sodium and chloride. Salts are necessary to plants, because it is in the form of diluted salts that all nutrients are taken up by plants- the macro and micronutrients plants extract from the soil. High salinity leads to water imbalance problems much as if the plant were not getting adequate water. A toxicity problem is different from a salinity problem, in that toxicity is a result of damage within the plant rather than a water shortage. Toxicity results when the plant takes up the toxic ions and accumulates the ions in the leaf. The leaf damage that occurs from both toxicity and salinity are similar in that it causes tissue death known commonly as "tip burn." The damage that occurs depends on the concentration of the ions in the soil water around the roots, the crop sensitivity and crop water use, and the length of time the crop experiences the ions. In many cases, yield reduction occurs. Because crops can not excrete salts the way humans do, salts gradually accumulate in a plant. As a result plants need a higher water quality than humans do. Much study in many countries has gone into evaluating water for crop use. Some of these studies have been on the effects of salts on soil characteristics. Generally, as sodium concentration increases, a soil will lose its aggregation, eventually leading to poor water infiltration. Many more salinity and toxicity studies have been done on plants themselves. Not all crops are equally tolerant of salinity and toxicities, and in general most plants respond to salinity and toxicities in a similar fashion. If a plant is intolerant of salinity, it will be intolerant of chloride, sodium and boron. Most annual crops are less sensitive to salts than tree crops and woody perennials, although symptoms can appear on any crop if concentrations are high enough. The reason for greater sensitivity for perennial crops is that the tree is sitting in the ground absorbing salts for a longer period than the lettuce plant that is harvested 3 months after planting. Furthermore, deciduous trees like walnut shed their leaves each winter, so they can handle salinity better than evergreens like citrus and avocado. To manage salinity and toxicities, water management is the key. Depending on water quality, an excess of water will be applied to the soil to leach the previously applied salts away from the root zone. The poorer the water quality, the more excess water is applied. Selecting a less sensitive crop is also an alternative when dealing with poor water quality. Some barley varieties can handle salinity similar to ocean water. Barley nets a grower $400 an acre, avocados $9,000 and $25,000 if the market is right for strawberries. Avocados are salt sensitive, so are strawberries and lemons and cherimoyas and star fruit and blueberries and raspberries and mandarins and nursery crops. We grow these because with our climate, very few other places can grow them and they return enough money for a grower to stay in business in an area where land, water and labor are expensive. We really don't have much in "alternative crops" to grow here. 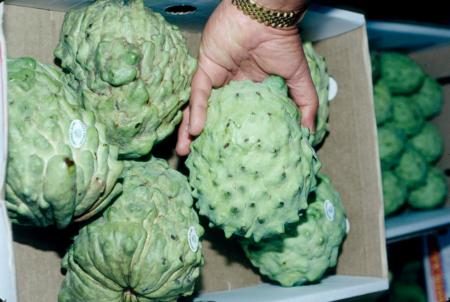 You can grow this fruit in Southern California, but can you sell it:? What a gorgeous fruit. Slice it cross-wise and you have a star-shaped garnish for salad or cooked dish. But you need to find a buyer for it. The star fruit, or carambola, is a member of the oxalis family. Only one other species is commonly cultivated for its fruit, the less esteemed, more frost sensitive Averrhoa bilimbi. The star fruit is native to Sri Lanka and popular throughout southeast Asia, India, southern China, New Zealand, and Australia. The tree is well adapted to a variety of tropical and subtropical climates and is now cultivated in Mexico, the Caribbean, Central and South America and to a lesser extent, Israel. The main restricting factor in California is frost, the tree being about as cold hardy as limes. The golden-yellow fruit is 3 to 8 inches long and 2 to 4 inches in width with an star shaped cross section. The thin skin, appears waxy but is edible. The sweet to acid flesh is juicy, crisp and mild flavored and usually eaten fresh. It makes an extremely attractive fresh or cooked garnish when cut to reveal its 5 or 6 pointed star cross section. It is also made into relishes and chutneys. The sourer varieties contain more oxalic acid and can be used for polishing brass and removing rust stains. The wood is used for furniture and construction. The fruit is used medicinally as a folk remedy for a large number of maladies including hangover.